Some obvious advices/facts before we dive into the review. This is NOT a standalone movie thus having knowledge from the TV series is highly recommended and also beneficial to your mind. Do NOT compare the pacing of the TV series with the movie. One is called a TV series and the other is called a movie for a reason, k? Both the TV series and the movie are by the original director and script editor so they know what they are messing with. Do NOT expect to see a lot of new footages. Does this mean this is a “recap” of the TV series? Not exactly. There are enough plot differences in the battles for this movie to be considered an adaptation instead of a complete “recap”. Is the movie rushed? To a large extent, yes it is. There is simply too much material to cover in too little time. This is probably what most people are complaining about. Is it worth your time to watch this? Only if you can distinguish what to expect between a TV series and a movie. The problem with trying to remake a masterpiece level of work (and that applies not only to anime) is that people will only be curious to see how the new work can surpass the previous work. Often people will have a pre-set level of expectation for these works and more often people will find themselves expecting too much and ended in disappointment. For example, after rating the original TV series 10/10, viewer X eagerly awaits the movie adaptation. But what can he really expect? That the movie worth 11/10? No, that is not possible. This is all thanks to something called human prejudice. Everyone who has seen the TV series first will consciously/unconsciously be comparing them. So please be mindful when watching the movie not to compare it bit by bit with the TV series. It is not fair for the movie. Those of us who have seen Tengen Toppa Gurren Lagann (TTGL) will know what it means when I say the show as a whole defies the Laws of Physics. While there are plenty of examples for that type of shows, TTGL is by far the most outrageous, thus the term “epicness” is seen wherever TTGL appears. The story of TTGL is a prime example of the “underdog” battle. The main characters began with very little fighting chance but every time they seem to turn the impossible possible. And how do they do that? With a DRILL of course! The movie has some great new battle scenes. Animation wise it is the same as the TV series (for those who like to compare the two). Most scenes were pretty consistent but lacking in details from time to time which is to be expected from the sketchy and cartoonish-looking animation. What truly makes TTGL “epic” though is that the scenes match well with the “mood” at that particular moment of the show. This is partially due to the great soundtracks and theme songs by Shoko Nakagawa. 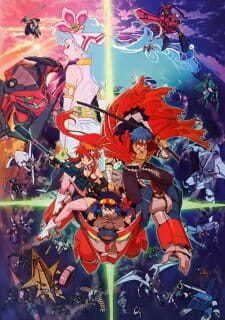 Overall those of us who are familiar with Gainax’s previous works will not be disappointed in TTGL. Character wise, there was a slightly heavier emphasis on Yoko in this movie which is great for all Yoko lovers. Simon and Nia also have a decent character development throughout the movie. Unfortunately, because of time constrain, there was not much character building for the secondary characters like Rossiu and Kittan who ended up being quite hollow. Thus if all you ever care about is Kamina, Nia, Simon, and Yoko, then there shouldn’t be anything wrong for you. For the rest of us … brace ourselves for some disappointment here. The following is targeted to those who have concerns with regard to the pacing of the movie. Ask yourself this, how long as it been from the end of the TV series to the airing of the movie. Answer: 11 month and 1 week (give or take a few days). Do you honestly expect to see tremendous differences (next to what it has presented already) given the time? Do you honestly expect to see a whole new story with the same awesomeness produced in 51 weeks? Given the time, though of course we can argue that they could have delayed the movie if things didn’t work out, I think it was a fairly decent job. Hopefully you will find it a good enjoyable watch too! Gainax have turned their series into movies before with Gunbuster vs. Diebuster and more recently the Rebuild of Evangelion tetralogy, now they've decided to give Tengen Toppa Gurren Lagann the same treatment. Unfortunately, the runtime doesn't allow for a sufficient amount of development and many elements have been lost along the way, though there are saving graces in the new material. The original series is twenty-seven episodes long, or - minus the openings and endings - around about nine hours. Gurren-hen follows the events of the first thirteen episodes and so is just over two hours shorter than its source material. As you would expect, much of the development is glossed over and the story proceeds at a lightning pace. The story itself is more or less the same as in the series - much of humanity lives underground until Simon and his 'bro' Kamina break free, to find the surface inhabited by 'Beastmen' who pilot giant mechas - with a movie-original opening and ending that sets things up nicely for the sequel. The plot comes across as - unsurprisingly - very rushed; the characters are offered little development and during the middle act there is a ridiculous - but unfortunately necessary - montage to progress the story. Developmental issues pave the way for an adequate at best plot. The animation isn't a huge step up from the series - if different at all - but the opening and the ending deliver some exciting new material. The ending, especially, is a welcomed feat. The new climax is both thrilling and well executed, and will have you eagerly awaiting the next installment. Corners have been cut, however, with the music. The score by Taku Iwasaki from the series returns with no new additions, which causes Gurren-hen - at times - to feel something along the lines of a movie-length recap; something you've already seen before. New inclusions to the soundtrack certainly wouldn't have gone amiss. The main trio and the prime supporting cast return in Gurren-hen, though most have left their depth and development at home, particularly Rossiu and Kittan. Yoko fans are offered more excessive fan service and Simon - in the new sequences - is particularly prodigious. The lack of development to the cast is massively disappointing, however, and causes Gurren-hen to come across as rather disengaged and retrogressive. Gurren-hen is an enjoyable movie, urged on by its source material, but is let down by lapses in development. The middle act could have benefited substantially from some new material, acting as a bridge between the beginning and the end, offering the supporting characters alternate introductions and addressing developmental issues, but instead the staff opt to rehash the series to a disjointed, disappointing effect. The new opening and ending sequences are both longer and far more engrossing than expected, however, which offer the movie some value. If you enjoyed the series, you'll get a kick out of the movie, but if you didn't, it's best to avoid Gurren-hen. If you're new to Tengen Toppa Gurren Lagann, the movie isn't worth your time, and may come across as completely incoherent, with many characters remaining a mystery; without motivation and depth, just empty shells. Gainax is one shrewd animation studio. With the reuse of 95% of the footage including the "infamous due to crap animation" episode 4 Gainax truly maximized their earnings. In addition to this, there are moments in the movie that felt diluted in contrast to the TV series. Maybe it's due to Gainax compressing half of the series to an almost 2 hour mark. Maybe it's poor directorship. I don't know. To be honest. The recap episode (ep. 16) owns the movie format. Then again. That was a recap. On the bright side. There is the Spiral King intro and the climactic battle between Gurren Lagann and Dai-Gurren against the 3 generals and virals's new flagship which is essentially a slightly modified version of Dai-Gurren. There are also some very minor new scenes snuck somewhere in the middle portions as another consolation to the folks who paid money for this. As a Tengen Toppa Gurren Lagann fan, I have to say that I didn't regret getting this just for completion's sake. Unless you wouldn't lose anything in watching this then I would say to go for it. But if you have better ways to spend your cash (or your bandwidth), then set it aside. My numerical rating (Story, Art, Sound, Character, Enjoyment, Overall) is a grade that sees the movie as standalone with knowledge of the series and not a comparison to the series. 8 - Very Good all around. Hard to compact a season of 27 episodes down into a 6 episode run-time, but for what it's worth, it pulled it off well. I gave it an 8 as I feel that is realistically what it was worth, I wouldn't have given it anything lower than a 7. But when compared to the anime series, it is (while there is a decent amount of new content), just simply falls miles short. Miles short and yet I'd still give it an 8. I'm trying to give a score that is not relative. If this was relative to the anime series, it would have scored in the 5 - 7 region, probably more around 5. I guess that just demonstrates how good I thought the anime was. This was good, the series was better. If you're looking into getting into Gurren Lagann, the anime series is the way to go. Am I the only one who thinks gurren lagann is a piece of crap?